A real treat from Mrs Beaton. This simple but superb recipe epitomizes Victorian tastes and makes a corking first course or supper dish. Melt the butter in a saucepan. Add the venison and port, spices, salt (to taste) and pepper. If it looks dry add more butter. Cook gently until blended and thoroughly hot. Turn out into small pots and allow to cool. Spoon over the clarified butter. Chill in the fridge. Serve with hot toast. King Edward's Angels on Horseback. A real delight from the table of King Edward VII. He adored this dish and it was often served as a savoury after the dinner main course instead of a pudding (or even as well as)! Wrap each oyster in a bacon rasher. Fasten with small skewers. Grill for 4-6 minutes. Toast the bread, cut into fingers and spread with the butter and Patum Peperium. Remove the skewers and place the angels on the toast. Serve hot! No mystery here Hesther was the 1st tea lady in the “Coffee Room” when I was in The Royal Household. Might not be historical (Yet) but her cheese straws were legendary and she gave me her recipe. Enjoy for the Christmas table! Rub the butter into the flour and add the breadcrumbs. Stir in the cheese along with the seasoning. Work thoroughly by hand. Cover for 30 minutes. Set the oven to 180 c. Roll out the cheese pastry and cut into strips. Twist the strips and place on a greased baking tray. Bake for 7-10 minutes. Allow to cool before serving. Here is a delightful alternative for a main course at Christmas time. The recipe comes from Normandy (No prizes for guessing that) and is simply stunning in its mix of flavours. This dish dates from the 17th century and is a joy to serve as well as eat. Set the oven to 180 c. Heat half the butter in a casserole and brown the birds well on all sides. Season. Place a rasher of bacon on each breast. Peel, core and chop the apples. Melt the remaining butter in a pan and add the apples, cooking until soft. Place the apples into the casserole and cook with the birds for 20 minutes. Remove and rest. In a saucepan mix and heat the cream, Calvados and salt pepper to taste. Do not boil ! Pour over the birds, garnish and serve. Let's go back to Queen Anne's time with this excellent stuffing mixture. During her reign this recipe was used for all manner of game birds from pigeon to widgeon! You may cook it in the cavity or separately if you wish. Melt the butter in a saucepan until golden (10 minutes). Combine the walnuts, anchovies, sausage meat, breadcrumbs and herbs in a bowl. Peel, core and chop the apple. Add it to the bowl with salt and pepper to taste. Stir in the onions and butter. Bind with the egg and if a little stiff add a small amount of milk. Now for a favourite of Prince Albert “The Good”. This recipe was certainly used during Yule in Germany from the 18th century. The nuts give it a delightful texture. 1 ½ lbs stoned, halved plums. Set your oven to 180 c. Place the plums in an oven-proof dish and sprinkle with the sugar. For the topping, sift into a bowl the flour and rub in the butter until a bread-crumb texture has been achieved. Stir in the Demerara, cinnamon and hazelnuts. Sprinkle the topping over the plums and lightly press down. Bake for 45 minutes until golden brown. Serve with brandy sauce! These delicious biscuits have been baked in Germany since the 13th century and always go down well on the Christmas tea-table. Grease a baking sheet and set the oven to 160 c.
Mix together the flour, sugar and spices in a bowl. Rub in the butter to an elastic dough. On a floured board lightly sprinkle the almonds. Roll out the pastry on the almonds to a thickness of ¼ inch. Cut into rounds or oblongs. On the prepared baking sheet sprinkle the almonds and lay on the biscuits, pressing down lightly. Bake until golden. Cool before serving. (The very best recipe in the world). Rind and juice of 1 lemon. Rind and juice of 1 orange. 1 teaspoon of mixed spice. 1 large bottle of Guinness. Mix all ingredients well. Pack into 3 two pound well greased basins. Cover with foil or a basin lid. Steam for 8 hours. If you are making one pound puddings steam for 6 hours. Keep „feeding“ the puddings with brandy each week between making them and serving them at Christmas. Re-heat by steaming for a further 1 hour (minimum). Serve with cream. 1 lb minced pork, ordinary mince is acceptable. In a deep pan melt the butter and add the mincedmeat. Seal well until brown then add the allspice and sugar. After 10 minutes add the fruit that you have soaked overnight in brandy. Cook for a further 5 minutes and add further brandy, allow to cool. Prepare the pastry and line your pie shapes. Fill your pies with the mincemeat and place your lids on the pies. Cook at 180c for 30-35 minutes until golden. Serve with brandy cream. Journey back in time to the reign of the great Queen Elizabeth 1st. This dish was seen on the royal and tables from the late medieval period and remained popular throughout the 16th and 17th centuries. This dish gives us classic English flavours and makes an ideal alternative to turkey. (Allow 1 pheasant for 2 people). Season the pheasant with the salt, pepper and nutmeg to taste. Heat the oil and butter in a casserole dish and brown your bird. Remove the pheasant and saute the mushrooms in the same dish. Add the apples to the dish and replace the bird. Pour over the wine cover with a lid and cook at 180c for 1 hour. When cooked remove and rest the bird. In the dish reduce the stock and add the cream. Pour over the bird and garnish with the watercress. A superb 18th century tavern dish from the West Country. This delight is excellent for your Christmas lunch. Allow 1 bird per person. This employs the use of cider brandy, the superb Somerset Royal is marvellous in this dish. Preheat the oven to 180c. Melt half the butter in a casserole and brown the birds. Season well. Place a piece of the bacon on the breast of each bird. Peel, core and cut the aplles into wedges. Heat the remaining butter in a frying pan and add the apples. Cook for 5 minutes and then add to the birds. Mix together the cream and brandy, season to taste. Heat gently but do not boil. Pour over the birds and apples and garnish with the parsley. A medieval side dish that is an ideal accompanying treat to your Christmas lunch. A favourite of Henry 5th. Melt the butter in a large frying pan, add the almonds and cook over a medium heat until golden brown. Add the courgettes and cook until golden turning frequently. Serve after seasoning to taste and garnish with chives. This is a seasonal delight from the 14th century. The recipe comes froms a German monastic cookery book dating from 1350 and imparts super sharp flavours to any winter meal. Melt the butter in a heavy frying pan. Add the onions and fry gently. Peel, core and slice the apples and add them to the pan. Sprinkle with the sugar and cook through for 20 minutes. Season well and serve. For an added flavour why not add 1 tsp of Carraway seeds to mix? A royal favourite from Victorias court. This dish was particularly loved by Prince Albert. Mix together the sugar and cinnamon and coat the bananas in the mixture. Melt the butter in a frying pan and fry the bananas for 2-3 minutes then turn and cook for a further 3 minutes. Sprinkle with any remaining cinnamon mixture and add the rum/brandy. Coat the bananas well and flambe with extra spirit. Serve with whipped cream! A masterpiece from Mrs Beeton. This was served at Balmoral Castle to the Emperor Napoleon 3rd and Empress Eugenie after their arrival in England and their exile. Soak the fruits overnight in brandy. In a saucepan bring slowly to the boil 1 pint of water and add the honey. Add the cinnamon, cloves and lemon rind. Simmer for 5 minutes. Drain the fruit and add to the liquid mixture. Simmer for 10 minutes and remove the cinnamon, cloves and lemon rind. Drain the fruit and serve. Whip couble cream adding some of the soaking brandy and spoon on the fruit. And now for one Richard II liked . . . IF you are looking for something different for dinner parties then this is a book that might just be the ticket as you bring out a recipe that the Crusaders used to wolf down after a hard day's . . . crusading. There is even a recipe popular with the home team in the Crusades with a lamb dish from Saladin's camp. It certainly makes a change from telling guests “this is Delia's starter” or ”I found this in Jamie's new book” or Nigella did it on TV or whatever. Rotherham, an expert of King Arthur and the Holy Grail, is also an authority on food though the ages and an avid collector of ancient recipes. Smith, a renowned chef, runs Thrales in Lichfield and makes recipes from the Egyptians and Romans to the Victorians work in a modern kitchen with ingredients you can pick up from supermarkets. The pair have been running demonstrations at the Garrick for three years which was the inspiration for the book published this month in associated with the theatre. The result is almost 80 recipes which are all steeped in history from an 18th century Christmas pudding - rated the best pudding ever by Smith - to mediaeval mince meat – with pork the meat part of the original dish. The recipes all have some history attached and there are a few unuusal combinations - unusual for now that is, for example in Norman times rabbit and apple pie was probably as common as steak and kidney. 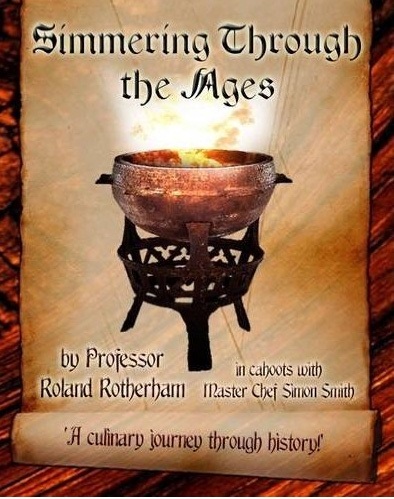 There is a couple of thousand years to go at in Simmering through the Ages although some of the dishes appear so modern that I suspect people would not know they were eating something that was enjoyed several hundred years ago. That shows that first that there is actuially not a lot really new in cookery and second that our ancestors were much more imaginative and much more skilled cooks than we give them credit for. The dishes range from light to hearty feast. How about a chicken and caper salad from the War of the Roses or a coriander and pine nut salad from the Crusades? From a 15th century monastic cookbook comes herring pie or how about one of the Iron Duke's favourites, liver and bacon with capers? There are 17th century strawberry tarts, Victorian strawberry and peppercorn pancakes, boar and pear pie from the Middle Ages as well as Sir Kenelm Digby's Winter Soup. Sir Kenelm was a courtier in the reigns of Elizabeth I and James I and this recipe comes from his household book. If that is a bit too modern then how about an Egyptian recipe from around the time of Christ with a spatchcock pigeon in a beer and berry sauce. There are tavern dishes, fast foods as well as fine dining with salads, fish, meat and puds in a book with plenty of historical food facts, cooking tips and , most important in any cookbook, interesting and tasty recipes which are easy to make and don't demand great technical skill. It could make an unusual gift for someone who enjoys cooking or provide a topic of conversation at your next dinner party. “Yes, this was one of James I's favourites” tends to beat telling people you found the recipe in a Sunday supplement. The cover price is £19.99 but the book is on sale at The Garrick or Thrales, currently at £14.99 or can be found discounted on the internet for under a tenner.